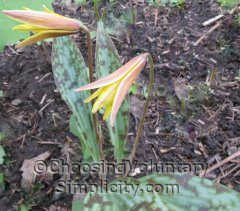 Dogtooth violets (Erythronium americanum) have many names, including trout lily and adder’s tongue. I would guess that the various names came about because the root is white and smooth and shaped like a canine tooth… and the leaves have prominent markings like brook trout and adders. 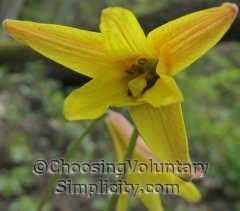 We always called them dogtooth violets, but they are not violets at all and are actually part of the lily family. Each mature plant will grow six to ten inches high, have two leaves that usually point in opposite directions, and will produce only one flower. Younger plants will have only one leaf and no flower. The flowers are bell-shaped and drooping. When the flowers are fully opened, the petals will bend backwards to expose six brown stamens. 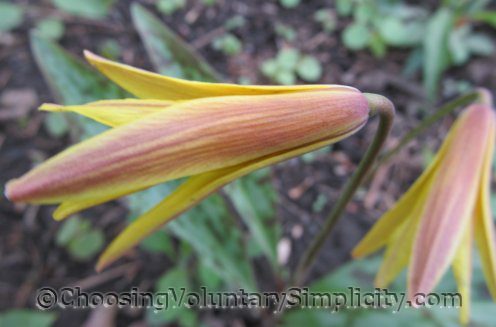 Sometimes we have so much rain and cloudy weather here in early spring, the dogtooth violets never fully open. I think they’re almost prettier, though, before the petals bend back. 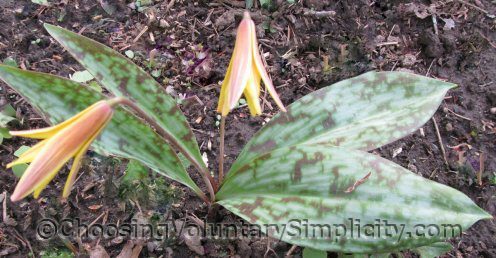 Most of the dogtooth violets around here have dark green leaves with bronze colored markings… these produce flowers that are deep yellow on the inside with maroon streaks on the outside. 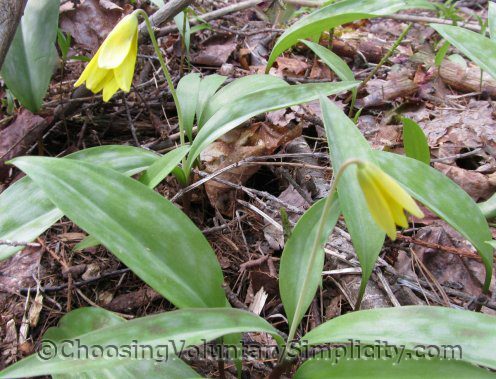 We also have some dogtooth violets that have only white markings on the leaves… these plants produce flowers that are a solid bright yellow. There used to be a lot of dogtooth violets in the woods across the road from our house. Unfortunately, these and many other wildflowers have been casualties of the new owners and their haphazard logging operations. We have tried to save as many as we could… perhaps in time we’ll have most of the different types of wildflowers… safe… and thriving again here on our side of the property line. i always believed that they were called trout lilies because when they bloom it’s time to fish for trout. around here they also tend to grow on the banks of fishing spots especially. fiddleheads are a a good indication of fishing time too and are rumored to be great bait. i’ve yet to see any bloodroot this year and have noticed the dawn chorus is especially quiet. 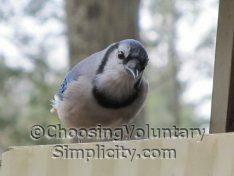 so sad to miss our springtime friends and the bigger truth this may foretell. My gran always said that they were called trout lilies because of the spots looking like the spots on brook trout. She had a great love for the wildflowers and every spring she would take me and my 2 sisters into the woods to look for flowers. We made pressed flower booklets and picked way too many of the wildflowers for bouquets. I remember how wonderfully sweet the mayflowers smelled but they are completely gone from those woods now. The tiny roots of these are edible. They taste somewhat like cucumbers but I wouldn’t want to kill a plant just to have that tiny bite. I think it’s wonderful that you are trying to save the wildflowers that are being killed out by the logging. There once were wildflowers near our property but no more. Too bad. I live in Co and we have these in pink. I did not know there were other colors. Ours don’t look exactly the same, the leaves look different but I looked it up and apparently they are all in the same family. Its an interesting wildflower and I must tell you yours is a very interesting blog. I just found you last week and I spend every minute I can reading through your archives. There is so much to read here and I can’t tell you how much I am enjoying getting to know you. Wish I could meet you in person. I can see that we are kindred spirits.